I know. I know what you're thinking. You're thinking about the movie "Three Amigos" based on the title of this article. Then when you look at the picture above you're scratching your head. That's why I called the article "The Three Amigos" so I don't get sued by the movie companies. If that makes sense to you, I imagine you are trying to solve the puzzle of three pears and the three amigos. Thought you would never ask!?! Apparently, there are at least 8 types of pears available to us. 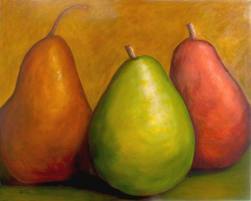 The ones above from left to right are called Bosc Pear, Green Anjou and Red Anjou. And, yes, they are amigos. Why? Because they are all fruit, specifically, pears. They have things in common. So, do alcoholics and addicts. Which brings me to recovery! Recovery is a new lease on life. It's a process and a journey. And, believe it or not, there are 'The Three Amigos" of recovery which are fellowship, love and support. Each of these three amigo's helps to defeat a specific problem with addiction. Fellowship is important because it helps relieve the problem of isolation. Addiction thrives in isolation. As recovering addicts and alcoholics reach out and join in fellowship with other addicts and alcoholics, they realize that their loneliness diminishes drastically and even goes away. Love is important in all of life, especially in recovery. Love helps to fix the problem of rejection and it's twin brother judgment. Love overrides those powerful forces that cause addicts to isolate, hate themselves, judge themselves, and believe they are unlovable. Finally, support is important because it helps to alleviate helplessness and gives strength. We all know that successful recovery depends on having support of sober friends, family, and the greater recovery community. When addicts and alcoholics open themselves to support, they find that they grow through the love of the fellowship and become stronger in their sobriety. So today, why not connect with someone in the fellowship and receive their love and support and give some in return. Notice how good it feels to know and be known. Oh, and don't forget, eat a pear! At The Coleman Institute, we specialize in helping people get clean and stay clean using 'the three amigos' of help, hope, and healing as we detox patients from alcohol and drugs. If you or someone you love is in need of detox from opiates, alcohol, benzos, Methadone, or Suboxone, please do not hesitant to call Jennifer Pius at 1-877-77-DETOX (33869). Help, hope and healing begin here!